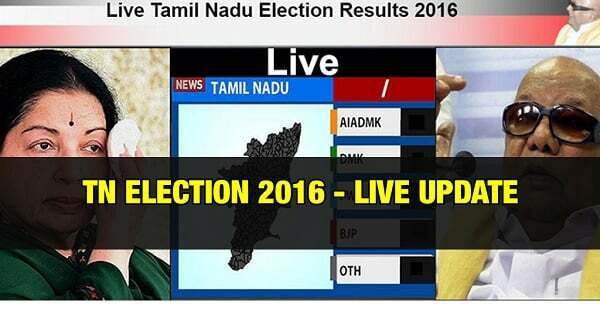 TamilNadu Election Results – Live Update – Election 2016: Tamilnadu Assembly Election 2016 counting has just started and here is the live update of TN Election results. The results of the much-awaited Tamil Nadu assembly elections 2016 held on May 16 will be announced today. This is among the few elections in the state which have left analysts confused on the trends, with exit polls predicting too close a race. The voter turn-out in Tamil Nadu was 74.25%. The state saw multiple contests in all constituencies for the first time with some 40 million people casting their votes for the 234 assembly. The ruling AIADMK was pitted against the DMK-Congress alliance, a front led by the DMDK of actor-turned-politician Vijaykanth, the PMK and the Bharatiya Janata Party (BJP).After cash seizures by Election Commission, counting in Aravakurichi and Thanjavur constituencies have been postponed. This Page is Updated every minute. Refresh to See the Updated Numbers.